1. Caplin rolling on the beach. 2. Caplin being used in the garden (or collected to be used). 3. Seaweed being used in the garden (or being collected). 5. Rock walls (we need many of these!). 6. Our Town flower (the orange daylily) in residents’ gardens. 7. Traditional fences (riddle fences, longer fences, etc.). 9. And any other picture demonstrating tidiness, environmental action, heritage conservation, community involvement, landscaping, & flowers! Our Canada Day Celebrations will start at 7pm at the Lower Pond with a BBQ, face painting, bouncy castles! Around 8:30 the BBBAA summer staff will be introduced, and everyone will join in to sing Happy Birthday to Canada – with cupcakes! Fireworks start around 10pm! June 9, 2015 at the Town Hall – 7:30 p.m.
Two Thirds of our Roads have been adopted! 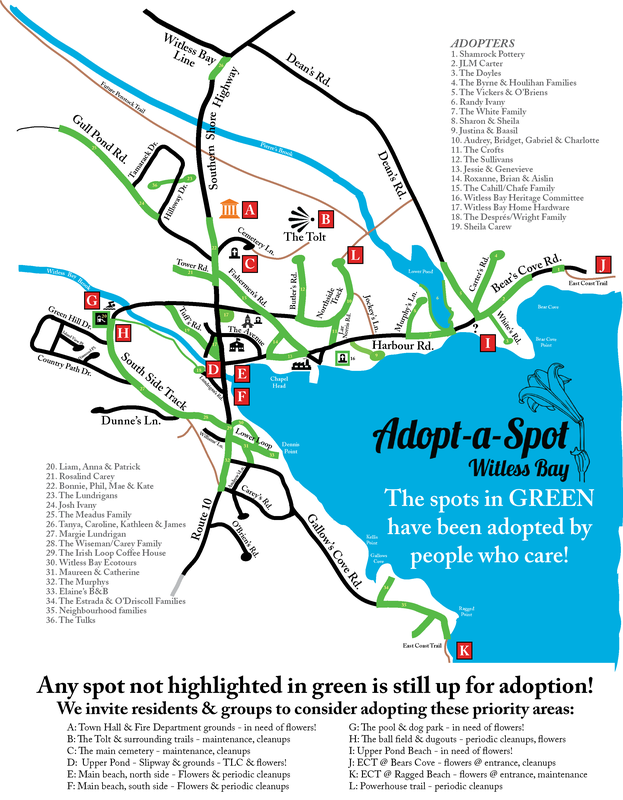 37 groups have now signed up for Witless Bay’s “ADOPT-A-SPOT program! Participants help maintain our Town’s natural beauty by “adopting” and caring for an area of their choice. This can basically be anything: a strech of coastline, a trail, the banks of a river, a public space, or a street. Anyone can sign up: residents, groups, families, associations & businesses! When you adopt a spot, it’s “yours,” so it really is up to you how you take care of it. At minimum, it would normally entail picking up litter regularly (at least once every two weeks during the summer). Reporting hazards to the Town is also appreciated (potholes, missing or damaged signs, etc.). But you can do more, if you feel like it! For instance, some people might prefer taking on smaller “spots” and focus their energies there by sweeping, planting flowers on town-owned land or on friends’, family’s & neighbours’ properties (with permission), etc… Anything that makes our community a better, prettier, more sustainable and safer place helps! Heather, Amélie and I have adopted a trail, and we’ve decided our participation will involve picking up litter, cutting down brush so it doesn’t take over the trail, and raking and repairing footpaths. This is a lot of work, so we’re doing it a little at a time. But it’s a lot of fun too, since it’s an excuse to go hiking with our baby girl! There are still tons of “spots” left – please message or call (1166) Mayor Sébastien Després for more info and/or to sign up! Great news – the Town of Witless Bay’s application for upgrading the second half of the South Side Track has been accepted by the Province under the Municipal Capital Works program! Ninety percent (90%) of the total project cost ($770,000.00) will be paid by the Province. Engineering will begin shortly, and roadwork is set to begin early to mid-summer. •	Plant more flowers in your yard! •	Share cuttings & seedlings with your neighbours! •	Adopt a town-owned spot & plant flowers! •	Plant a flowering garden this season! The Witless Bay Mayor’s Hike for Heart & Stroke will take place on JULY 22nd this year. Everyone is welcome to join in on the hike, but even if you can’t make it on the trail, please consider supporting this worthwhile cause by pledging another participant to help with life-saving research. A minimum donation of $25 is required to receive a t-shirt, but any donation helps with the fight against NL’s #1 cause of death. To donate or to obtain fundraising materials, please contact Mayor Sébastien Després (334-1166). A receipt will be issued for any amount donated. Witless Bay’s residents, associations and businesses are invited to adopt a spot in our community! Participants in our Adopt-A-Spot program help maintain our Town’s natural beauty by “adopting” and caring for an area of their choice (a strech of coastline, a trail, the banks of a river, a public space, or a street). Check out the map at the back of this Newsletter to see which spots are still available! For more info, please contact Mayor Sébastien Després (334-1166). The due date for taxes is May 31st. A monthly interest fee of 1.5% will accrue on unpaid account if suitable arrangements are not made to have the account paid in full by October 31st. Accounts in arrears after this date will be prepared for collection. JUNE 23RD: HELP MUN STUDENTS TIDY UP OUR OLD CEMETERY! COMPOSTING & COMPOSTERS – FREE TRAINING WORKSHOP: JUNE 2ND! The Town of Witless Bay has partnered with MMSB again this year, and has purchased 50 more plastic composters that will be sold to residents at the subsidized cost price of $25. Bins will be sold on a first come, first serve basis – call the Town Office to reserve one! A FREE “Learn to Compost” workshop will be offered at the Town Office on Tuesday, June 2nd at 7pm. The Town of Witless Bay thanks the 64 volunteers who joined the Kinsmen, the Witless Bay Town Council, & our Community Enhancement Committee to make our 2015 Kinsmen Community Cleanup a FANTASTIC success again this year, with 170 bags collected! This event was sponsored by the Witless Bay Kinsmen, Tim Horton’s, the Witless Bay Home Hardware, the Knights of Columbus, & the Town of Witless Bay. Great job, everyone!!! The Province requires that a permit be obtained to light outdoor fires to clear land or burn brush within 300 metres of a forest. Permits are free, and can be obtained from Forestry Services’ District Office (220 Paddy’s Pond Road, St. John’s; 729-4180; www.nr.gov.nl.ca/nr/forestry). Please exercise great caution every time you light a fire! We have had many inquiries about delays in re-opening of the Town’s Recreation Centre (our Puffin Centre). Council has been trying to work through the many issues with this building since they arose. While waiting on the approval of Service NL last September, Council discovered that the town’s engineer did not have the septic system inspected and approved prior to its being covered over. As a result, Service NL determined that the system would have to be uncovered and inspected. Minor issues were identified, but Council dealt with these immediately and the Inspector approved the system. Service NL then informed the Town that a set of architectural plans would be required. These were supposed to have been done prior to the start of the building, but the Town was never made aware that they had not been completed. No architect was willing to approve the plans drawn by the town’s engineer or willing to draw plans for a building that was already built. Through further discussions, it was determined that an “as-built” report by an architect would satisfy Service NL’s requirements. When the report was completed, a number of changes to the building were required, which the Town promptly addressed. Service NL then requested a recent survey of the land. When the Town sought to obtain this survey, Council was informed that the Town does not own the land on which the building sits. The Town had applied for this Crown land a number of years ago, but the application was never processed by the Province. The Town has now renewed this application, and we are hopeful that this is the last of the challenges we will face with the opening of the Puffin Centre. We apologize for the delays and the frustration it has caused the users of this facility. Unfortunately, most of the challenges we have been facing were out of the Town’s control. Displaying your civic number on your house or at the end of your driveway ensures fast emergency response for the AMBULANCE, FIRE and POLICE Services. Street numbers ensure that emergency responders can find you or your neighbor easily to save lives & property. They also help first responders calculate when to start slowing down for the number they are looking for. Our Community Enhancement Committee is launching a contest for the best/most original civic addresses to encourage our residents and businesses to post their street numbers! To participate, simply submit a picture of your original civic number to the Town (email your picture to townofwitlessbay@nl.rogers.com or drop it off at the Town Office, with your contact information). The deadline for the contest is July 16th. HAPPY SPRING CLEANUP MONTH FROM THE TOWN COUNCIL & STAFF! Town Clerk-Manager Geraldine Caul, Assistant Clerk Barb Harrigan, Grounds/Maintenance Aiden Carey. 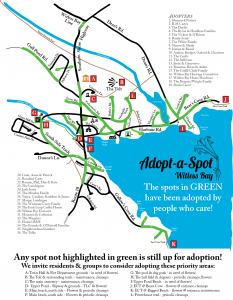 29 groups have already signed up for Witless Bay’s “ADOPT-A-SPOT program since it was launched on May 9th! Participants help maintain our Town’s natural beauty by “adopting” and caring for an area of their choice. This can basically be anything: a strech of coastline, a trail, the banks of a river, a public space, or a street. Anyone can sign up: residents, groups, families, associations & businesses! But you can do more, if you feel like it! For instance, some people might prefer taking on smaller “spots” and focus their energies there by sweeping, planting flowers on town-owned land or on friends’, family’s & neighbours’ properties (with permission), etc… Anything that makes our community a better, prettier, more sustainable and safer place helps! There are still tons of “spots” left! Please message or call (1166) Mayor Sébastien Després for more info and/or to sign up! May 12, 2015 at the Town Hall – 7:30 p.m. There was another GREAT turnout for the Kinsmen Community Cleanup this year! Thank you to the SIXTY-FOUR (64!) volunteers who joined the Witless Bay Kinsmen, the Witless Bay Town Council, & our Community Enhancement Committee to make our cleanup a FANTASTIC success! This event was sponsored by the Witless Bay Kinsmen, Tim Horton’s, the Witless Bay Home Hardware & the Town of Witless Bay! MAY 9TH – KINSMEN COMMUNITY CLEANUP: Witless Bay’s annual spring cleanup is taking place on SATURDAY, MAY 9th (weather permitting). To prepare the Town for this summer’s provincial Tidy Towns and National Communities in Bloom contests, we’re aiming to make this the biggest cleanup ever. 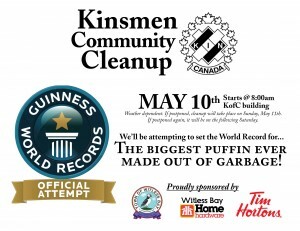 We’ll be attempting to break a the record we set last year for the biggest puffin ever made out of garbage! The event starts at 8:00am sharp at the Knights of Columbus Building, and is sponsored by the Town of Witless Bay, Witless Bay Home Hardware, Tim Hortons & Robin’s Donuts (who’ll be providing refreshments & snacks!). MAY 9TH – OFFICIAL LAUNCH OF OUR ADOPT-A-SPOT PROGRAM: Participants in Witless Bay’s Adopt-A-Spot program “adopt” and care for an area of their choice (a strech of coastline, a trail, a public space, or the street you live on!). Sign up during the Kinsmen Cleanup! For more info, please contact Mayor Sébastien Després (334-1166). STUDENT SUMMER JOBS: The Town of Witless Bay has applied for funding under the province’s Student Summer Employment program, which enables students to work in their home community during the summer, develop transferable skills, explore career interests and help non-profit organizations carry out their programs. Applicants must be residents of Witless Bay, and be undertaking Level I, II, III, or postsecondary studies in the coming year. The pay: $10.25/hr. Deadline for submission of applications is 12:00noon, May 20, 2015. TOWN INFRASTRUCTURE MAINTENANCE & REPAIRS: Over the next months, there will be roadwork throughout the community, with extensive ditching, road repairs, and shouldering being undertaken by the Town. NL Power will also be beginning the first phase of its penstock replacement project, which involves upgrading the roadway from the end of Northside Track up to the Penstock and brush cutting from the powerhouse to Gull Pond. PERMITS: Spring signals the start of construction season in the town. Although the deadline for submissions is 12:00noon on the Thursday prior to each public meeting (on the 2nd Tuesday of each month), it’s a good idea to submit applications early, since this ensures that Public Works is able complete the necessary site visits and verify that applications are duly completed before the public meeting. TOWN COUNCIL & STAFF WISH ALL RESIDENTS A FANTASTIC SPRING! This year, the Town of Witless Bay is participating in TWO community improvement & beautification programs: “Tidy Towns NL” and a national competition titled “Communities in Bloom.” To help prepare our town, the months leading up to the judges’ visits have each been given a theme! Winning Municipalities NL’s Tidy Towns competition last year was a big deal, since the competition isn’t just about keeping streets clean. A Tidy Town improves Witless Bay’s economic prospects, attracts business, boosts tourism, increases residents’ standard of living, enhances civic pride, connects residents together, & broadens volunteer networks! The judges were impressed by the incredible amount of work that was done this past year to beautify the Town. A big thanks goes out to the Community Enhancement Committee, our residents and volunteers, the Heritage Committee, and our Town Council & staff. Thanks also goes out to the many community groups and associations who pitched in and donated their time and energies to this effort (the Kinsmen, The O’Connor 50+ Club, the Girl Guides, the Our Lady Star of the Sea Parish, the BBBAA, the Puffin Patrol, St. Bernard’s Elementary School, Mobile High School, the Witless Bay Regional Fire Department, and all the others!). Credit also goes out to the many businesses who helped in our Tidy Towns bid, including the Witless Bay Home Hardware, Witless Bay Ecotours, Needs Convenience, Independent Consultants Group, Felix’s, & the great team at Municipalities NL! So long, garbage. Hello beautiful Witless Bay! ADOPT A ROADWAY! Choose a strech of road and keep it beautiful, maintaining it free of garbage and debris, tending to the plants and grass, etc! ADOPT A SPOT! A number of spots throughout the community are in need of being beautified with plants, flowers, shrubs & plain old TLC! ADOPT A TRAIL! Why not enjoy the scenic beauty of Witless Bay’s trails while contributing to the community? Sign up to keep a trail clean from litter and ensure that it remains safe for others by reporting & addressing hazards! ADOPT A SHORELINE! Help out the environment and our Ecological Reserve by keeping a shoreline clean of debris and garbage! contact Mayor Sébastien Després: 334-1166! The Town of Witless Bay has applied for funding under the Student Summer Employment Programs. The student Summer Employment Program is a program that enables students to work in their home community during the summer, develop transferable skills, explore career interests and help non-profit organizations carry out their programs. Students will be paid the minimum wage of $10.25 per hour. 1. Students must be planning to attend a post-secondary institution on a full time basis in the coming academic year. 2. Students must have been registered as a full time student in the previous year. 3. Applicants must reside in Witless Bay. 1. Must be a student who is enrolled in Level I, II, or III. 2. Applicants must reside in Witless Bay. Deadline for submission of applications is 12:00 p.m., Tuesday, May 20, 2015.
b. Amendments to appeal provisions in Urban & Rural Planning – information only. JOIN THE COMMUNITY ENHANCEMENT COMMITTEE! The goal of this committee is to make Witless Bay a better, friendlier, even more beautiful place to live. Meetings during the Spring and summer are from 7:30pm to 9:00pm on the first and third Tuesdays of each month. The next meeting takes place on TUESDAY, MARCH 3rd at 7:30pm in Council Chambers. We hope to see you there! The 2014-2024 Municipal Plan has now been submitted to the Province for registration. The result of many hours of study, analysis, and extensive public consultation, the purpose of this plan is to ensure smart development for a prosperous town. Attached to this Newsletter are the details relating to the two issues that have received the most attention during the past months. We invite residents to read about Council’s decision to retain the original RURAL zoning at Ragged Beach, and Council’s decision to increase the minimum lot size in undeveloped parts of the town, ensuring that future subdivisions are an asset, not a liability. Describing what they wish Witless Bay would be like in the year 2030, residents painted a picture of a town that looks a lot like the place we know and love today: a beautiful community with rural charm, a rich heritage, and rugged natural beauty. The Town’s new Tourism & Business Renewal & Growth Strategy will help diversify our local economy and create a more stable commercial tax base by guiding Council in the coming years, establishing clear goals and actions to be followed so that we can continue to make Witless Bay an even better place in which to grow and prosper. Next month’s newsletter will have all the details! THE TOWN COUNCIL & STAFF WISH ALL RESIDENTS A SAFE WINTER! Lot size has an important impact on a broad range of issues. The most obvious of these is the risk of problems with the water table. Allowing half-acre lots in future subdivisions would eventually force the Town to install piped water & sewer, at great cost to our residents. We don’t need a crystal ball to know this – we just have to look to the hundreds of other NL communities that have found themselves in this position. Until very recently, residential development in Witless Bay took place slowly and naturally. Because of this, the town we know and love today has narrow lanes, houses at various levels from the road, roads on steep inclines, irregular lots, and will soon have nearly forty kilometres of winding roadway. While these things make Witless Bay the gorgeous place we get to call home, they also would make the installation, operation, and maintenance of public water and sewer exceptionally costly. • Larger lots are more comfortable for homeowners, their children, and their pets. • They help protect the community’s rural character & are better for a rural lifestyle. • They have a positive impact on the community’s property values & resale values. • They allow subdivision developers to do selective cutting instead of clear-cutting. • They are much more flexible. They allow for later remodeling and expansion. • Larger lots allow for a better siting of structures and more organic landscapes. • They allow for gardening, increased self-sufficiency, and enjoyment of their property. • Larger lots require much less reworking for septic installation. • Larger lots also help produce privacy (for both current and future residents). Residents have asked Council to protect the rural character of the community and its water table. This has come through as a priority during public consultations, strategic planning retreats, public hearings, residents’ advisory committee meetings, and in everyday correspondence. One-acre lots in newly developed parts of the town will help protect our water supply, preserve our community’s rural character, & keep taxes low. Although many people are not aware of it, the new Town Plan does NOT rezone the private land at Ragged Beach. This area has always been zoned rural, and it remains rural in the new Town Plan. While Council did initially intend to rezone this section as “recreation,” it was finally decided, last August, that it will keep its original zoning. Council thoroughly examined the proposal to develop Ragged Beach and met with the developer a number of times to discuss the many impediments to the project. Council finally assessed that allowing a subdivision at this site is not in the best interests of the community, since the issues, problems, lost opportunities, and costs related to the project far outweigh the benefits the Town and its residents would reap from it. The very first time the proposal for a development at Ragged Beach was presented to Council (early 2010), the issue of access was identified as a concern. This was set as a condition, and repeated throughout the history of the file. Access to the property has not been demonstrated, after more than five years of repeated requests from Council. The issue of access is complicated by the regulations, which stipulate that no dead-end street can be over 300 metres in length. To circumvent this regulations, the subdivision proposal at Ragged Beach called for the construction of a cul-de-sac coming out from a dead-end road which itself would come out from the end of another lane at the end of another dead end road. This complicated scheme required the Town to treat three sections of the same road as three separate and distinct roads. Such distortion of the facts for the Town to avoid following its own regulations (and the Province’s) is questionable and would set a dangerous precedent. When the Ragged Beach file was discussed by the past Council, it was made very clear that no expropriation would take place. And rightly so: Expropriation is a governmental power reserved for circumstances where the public interest is clearly served, and the proposed subdivision does not meet this conditions. Since the path proposed as an access to the proposed subdivision has never been owned by the Town, the expropriation of land and assets from private landowners would therefore be necessary for development to proceed at Ragged Beach. Since the Expropriation Act is unclear about what constitutes “land detrimentally affected by an expropriation,” this could expose the Town to a many unforseen financial responsibilities. Members of the former Council also made it clear that Mullowney’s Lane would not be widened to allow for the proposed development. Since then, however, the Minister has made the widening of this lane a condition for rezoning. While the applicant had offered to pay for a portion, a substantial portion of the cost would nonetheless fall on the Town. Legislation states that a municipality must compensate landowners for the removal of improvements within a street reservation when these were built before a road was approved by council. This is treated as an expropriation under the Planning Act. There are a number of such improvements on Mullowney’s Lane, including two wells. The widening Mullowney’s Lane therefore exposes the town to significant costs. One of the top priorities of a municipal government is to ensure its financial wellbeing. Allowing the development of land at Ragged Beach would be detrimental to the town’s financial position, with costs far outweighing benefits. In addition to construction costs, road maintenance and snow clearing costs of the proposed roadway would be the Town’s responsibility. The cost of servicing and maintaining this roadway would outweigh the tax revenues generated by the proposed development. Piped water and sewer, should these ever be required in this area, would be cost-prohibitive. Ragged beach has long been recognized as one of the community’s key assets. Designated as a park in the 2005 Town Plan, the town’s 2010 Integrated Community Sustainability Plan highlighted the importance of preserving, sustaining, and protecting this site. Witless Bay is perfectly situated to capture an important share of the province’s billion-dollar tourism industry. One of the obvious stopping points along the Irish Loop, our beautiful town has a lot to offer: it is home to the largest colony of the province’s official bird, and our Puffin Patrol is attracting international attention. Witless Bay has breathtaking views, great beaches, tons of heritage homes and buildings, some of the best angling around, fantastic trail systems for hiking and snowmobiling, and a stunning pristine rural coastline. National Geographic Traveller Magazine has rated the Avalon’s Coastline as the world’s top Coastal destination. Witless Bay just became the first town in the area to win a Tidy Towns award, and has been invited to participate in the national Communities in Bloom competition. These significant achievements demonstrate that Witless Bay is well on its way to realizing its extraordinary potential as a tourism destination. For the town to achieve its potential, however, its key assets must be carefully managed and protected. A number of experts, specialists, groups, citizens’ organizations, and associations have voiced grave concerns about the environmental impact that the proposed development could have on the nearby ecological reserve, as has the Province’s Minister of Environment and Conservation, who invited Council to proceed with caution. The Witless Bay Ecological Reserve has great potential as an economic driver for our community, so it makes good business sense to protect it. There has been unprecedented opposition to the proposal to develop a subdivision at Ragged Beach. Over 400 letters opposing the project were sent in by residents of Witless Bay. In addition to these, nearly 1000 additional letters were submitted by various other stakeholders. Only 11 individuals ever submitted letters in favour of the project. Hundreds of residents have asked Council to consider the importance of Ragged Beach for their families, to recognize its symbolic importance to the community, and to realize this area’s great potential as an income generator for the town. The opposition to the development of Ragged Beach was consistent throughout the Public Consultation process that was held to allow for various stakeholders’ opinions to be heard. The report submitted by the Public Consultation Planning Committee was squarely opposed to it, and our Town Planner advised the Town against it. The series of public consultations held by the current Council regarding the future of our town have re-confirmed the importance of this area to our residents. The Commissioner’s Report from last summer’s Public Hearing (available at the Town Office) confirms the merit of Council’s approach and validates the land use planning decisions made by the Town. in the 2014-2024 Municipal Plan. At the November public meeting of Council, Mr. Fraser Paul accused Councillor Wiseman, Councillor Carey, and Councillor Smart of being in a conflict of interest in relation to the adoption of the Town Plan. Mr. Paul’s reasoning was that land owned by these councillors had been rezoned in the new Town Plan, therefore placing them in a conflict of interest. After reviewing the matter, however, it was clear that there was no possible conflict of interest in this case, since the decision to rezone this parcel had been voted on and submitted to Municipal Affairs by the former Council, years before these three councillors even took office. THE FOLLOWING IS THE FULL CONTEXT OF WHAT TOOK PLACE. THE TOWN WILL BE ISSUING A FORMAL STATEMENT RELATING TO THE ACCUSATIONS MADE IN THE COMING DAYS. At an informal meeting last September, a discussion took place between five members of Council regarding the coming year’s snow clearing contract. During this discussion, a strange case was brought up: some roads in the community have been snow cleared by the town’s operators for the past number of years despite the fact that the roads in question do not appear on the town’s Limits of Service map or the town’s Snow Clearing Roads List. No one present could explain the reason for this discrepancy. The next day, it was discovered that Councillor Carey and Councillor Wiseman own a parcel of land situated along the road in question. Having confirmed the ownership of the land, and recognizing the possibility of a conflict of interest, I called Municipal Affairs for guidance. 1. Instead of stating that there were “concerns” about a “possible” conflict of interest, the letter stated the matter as fact. 2. The letter was sent on behalf of the Town without having been cleared by the remainder of Council (I was the only voting member of Council to sign off on it or see it before it was sent). The day before the private hearing was to take place, five members of Council called a meeting to discuss pending issues. I was unavailable at the time for which this meeting was scheduled. When the matter of the conflict of interest and the private hearing came up, Councillor Wiseman and Councillor Carey excused themselves, and the three remaining councillors voted to cancel the private hearing I had called. Since quorum was lost after Councillor Carey and Councillor Wiseman excused themselves, however, the decision to cancel the private hearing was no more valid than my decision to schedule one in the first place. While the private hearing did not proceed the next day, we did hold a meeting to discuss possible ways forward, where I explained my understanding that our duties as elected representatives require us to deal with the possible conflict. I insisted that a private hearing be held so that Council could make a formal decision on the matter. The two other councillors who were present at the time of the discussion in question (Councillor Mair and Councillor Hann) voiced their disagreement, explaining that they had no concerns whatsoever about what had happened, and that there was simply no reason for concerns relating to conflicts of interest. Recognizing the importance of discussing the matter with the two councillors who had not been present on the evening of the informal meeting and of giving an opportunity to Councillor Wiseman and Councillor Carey to present their position, I insisted that the private hearing proceed (as I had been instructed to do by Municipal Affairs). Dismayed by this unilateral decision about the necessity of a private hearing, Councillor Mair and Councillor Hann left the meeting, informing us that they were resigning from their seats on Council. Letters of resignation arrived shortly thereafter. On the same evening, the Town received an email from Municipal Affairs with clarifications on some of the procedural matters surrounding the need for a private hearing. Since some of the information in this email could potentially have had an impact on Councillor Mair’s and Councillor Hann’s decision to resign, I wrote to Municipal Affairs explaining what had happened and asking whether the genie could be put back in the bottle. Municipal Affairs’ response made it clear that it was impossible for our two newest members of council to “unquit” and regain their seats because they had already submitted written notices of resignation. Having lost two councillors, and with two councillors unable to vote on their own fate as per the Municipalities Act, Council was left without a way to resolve the situation, since a quorum of four is required for any decision of Council. In order to move forward, Councillor Estrada and I agreed to request the Minister’s permission for a reduced quorum of three to make the decision on behalf of Council. We received the Minister’s response to our request in late November. Permission was denied, leaving Council without the legislative means to make a decision relating to this possible conflict of interest until the town has a full complement of seven councillors. While I did, in my role as Mayor, raise a concern about a possible conflict of interest, it is important to note that I do not have the authority to make a decision about whether such a conflict took place. This is necessarily a decision of Council. Without a full complement, however, Council does not have the power to make a decision either. Decisions relating to a conflict of interest involve the possibility of vacating the seats of duly elected members of a government, so these are particularly delicate and must be made following the proper protocol. Failing to follow procedures can expose the town to legal action. Witless Bay has been growing at a lightning pace for the past few years. In order to secure Witless Bay’s future prosperity and ensure the town’s long-term sustainability, we must now work to diversify the town’s tax base with growth in business and industry. This is important in terms of economic growth and tax base stability. It will also provide new opportunities for residents and stakeholders, create new jobs, enhance the quality of life of our residents, assist in the maintenance of our infrastructure, attract new investments, and help keep residential taxes low. We’ve already made big steps in this direction. Over the past eighteen months, we’ve managed to grow our business complement significantly, we’ve worked to make our town a safer place, and have made increased investments in recreation infrastructure to enhance residents’ quality of life. But a lot more is left to be done. At this Tuesday’s monthly public meeting of Council (7:30pm), the Town’s new Tourism and Business Renewal and Growth Strategy will be presented to Council by our consultant. The result of over one year of consultations with residents and local businesses, discussions with funding agencies and government departments, community participation, and professional input and analysis, this impressive document lays out the key goals to be achieved in order to ensure a strong and diversified economy for the town, and it identifies the steps to achieving these goals. This is exciting news – Join us and see the presentation! The election will take place on Wednesday the 25th of February, 2015 between the hours of eight (8) a.m. and eight (8) p.m. The polling booth will be located at the Witless Bay Town Hall. Nominations of candidates for election to the council for the Municipality of Witless Bay will be received between the hours of 8:00 a.m. and 8:00 p.m. on January 21, 2015 at the Witless Bay Town Hall. Nominations shall be in writing and state the name and civic address of the candidate and shall be signed by the Proposer and Seconder both of whom shall be present together with the candidate who shall sign also signifying his/her acceptance. In the event that a candidate cannot be present for his/her nomination, his/her Proposer and Seconder can complete the required form. Every candidate shall at the time of his/her nomination, deposit with the Returning Officer, the non-refundable sum of ten dollars ($10.00). (1)	Canadian Citizen of the full age of eighteen years. (2)	Resident of the municipality or area for at least 30 days immediately prior to the date set for the nomination period. (3)	Not indebted to the Council for any arrears of taxes or other charges. (4)	Not otherwise disqualified under the Municipal Elections Act. We’re holding a special meeting of the Community Enhancement Committee on Tuesday, November 4th, starting at 7:30PM. Pat Curran will be helping us create a vision for the Town! Once approved & ratified by Council, this short statement will guide the Town in each of its undertakings. The purpose of this vision is to drive the town, its residents, businesses, industry, and, most especially, its Council, towards achieving a common goal, and to serve as a constant reminder of what we are trying to achieve together. We hope to see you on Tuesday evening! 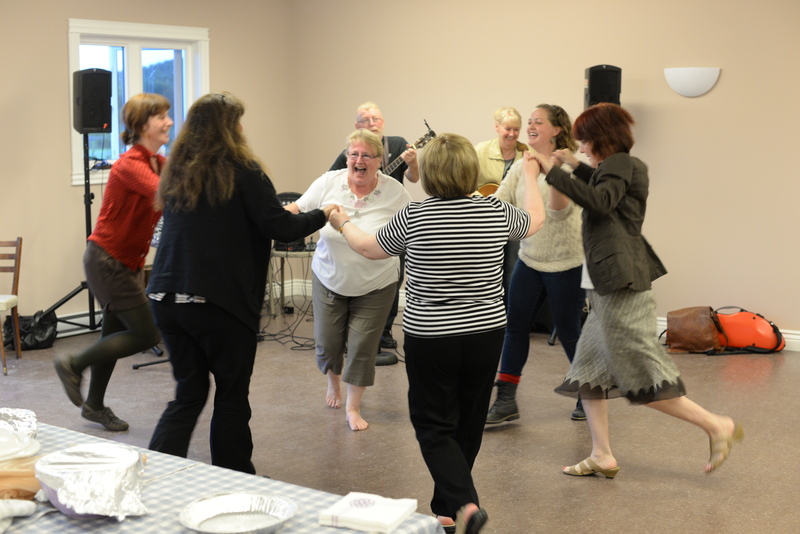 Witless Bay: Tidy Towns 2014 Winner! Congratulations to the hundreds of people who helped make this possible!!! Thanks goes out to our residents and volunteers, the members of the Community Enhancement Committee, the Heritage Committee and Council, our Town staff, as well as the many groups and associations who pitched in and donated their time and energy to this effort (the Kinsmen, The O’Connor 50+, the Girl Guides, the Our Lady Star of the Sea Parish, the BBBAA, the Puffin Patrol, St. Bernard’s Elementary School, Mobile High School, the Witless Bay Volunteer Fire Department, and all the others!). Thanks also goes out to the many local businesses who helped us in our Tidy Towns bid, including the Witless Bay Home Hardware, Witless Bay Ecotours, Needs Convenience, Independent Consultants Group, and Felix’s. Thanks also to our Town Planner (Plan-Tech Environment), Eastern Waste Management, the fantastic staff at the Department of Municipal and Intergovernmental Affairs, and the great team at Municipalities NL! DRAFT AGENDA: OCTOBER PUBLIC MEETING! g. BAE Newplan Group Ltd.
h. Meeting with Small Craft Harbours – October 16 @ 3:00 p.m. The bulk collection that was scheduled for last week has been rescheduled for Friday, September 26, 2014. Bulk items must be placed at the roadside by 7:00am on September 19th. It may take a number of days for bulk items to be collected from all residents. A limit of 500 lbs or one pick up load (whichever is less) will be collected from each household. The last bulk garbage pickup of the year will be on November 28th. INTRODUCING THE WITLESS BAY PUFFIN CENTRE! Council held a contest where we invited the students at St. Bernard Elementary and Mobile High School to name our new recreation centre. Almost 200 students participated in the contest, and over 50 suggested that it be named after our Town’s main emblem, the North Atlantic Puffin. After a series of consultations, it was decided that the new building would be called THE WITLESS BAY PUFFIN CENTRE! The building is now available for rental – Drop by the Town Office to pick up a rental agreement! Witless Bay Council is spearheading the preparation of a regional Emergency Management Plan for the Bay Bulls to Bauline area. Part of this exercise involves training the volunteers. Fire & Emergency Services will be coming to Witless Bay to offer the “Basic Emergency Management” course on three consecutive Wednesday evenings (6pm to 10pm): November 19th, November 26th, and December 3rd. Please contact the Town Office to sign up: 334-3407. To protect residents & landowners from issues resulting from unregulated, unauthorized & unlawful development, the Town requires that a permit be obtained before the start of any construction project or project involving machinery which transforms the landscape or alters water flows. Carrying out work without a permit or with an expired permit carries a fine of up to $5,000 for a first offence, and if the work violates zoning regulations, laws or by-laws, an additional fine of up to $10,000 may apply. The owner may be held responsible for the cost of dismantling the construction and restoring the site, as well as the cost of rectifying any problems. The fine for disobeying a Stop Work Order is $500/day. If you’re considering a project, please visit the Town Office to obtain an application form & a copy of the applicable bylaws, policies & procedures. Council meets on the second Tuesday of every month, at 7:30pm. The deadline for your application to be considered at the next public meeting is at Noon on Thursday, October 9th. A SCUFF & A SCOFF! The Town is holding a going-away party for the Folklore students who spent the month of September in the community. The party starts with a community potluck supper, followed by a presentation by the students. The students will tell us about their experience in our community, show us their work and describe what they’ve discovered. After the presentation, we’ll have a party with local entertainment! Remember to bring your instruments and your dancing shoes! Admission is FREE (just bring a dish to share!) and everyone is welcome! BULK GARBAGE RESCHEDULED TO SEPTEMBER 26th! Eastern Waste Management got in touch with us so that we can notify residents that the bulk collection that was scheduled for Friday, Sept. 19, 2014 has been rescheduled for Friday, September 26, 2014. It may take a number of days for bulk items to be collected from all residents. A limit of 500 lbs or one pick up load (whichever is less) will be collected from each household. The last bulk garbage pickup of the year will be on November 28th. Eastern Waste Management is doing a bulk garbage collection this Friday. Bulk items must be placed at the roadside by 7:00am on September 19th. It may take a number of days for bulk items to be collected from all residents. A limit of 500 lbs or one pick up load (whichever is less) will be collected from each household. i. Request for weekly use of Witless Bay Community Centre for item 5 i. Community Supper at our NEW rec building! On Sunday, September 7th, Council is holding a community potluck supper at the new recreation building! We will be welcoming the graduate students who will be spending three weeks in Witless Bay this month, working to record our town’s traditions and customs. Join us at 6:00pm for supper and a time, and don’t forget your instruments! Mummers allowed in! Business & Tourism Strategic Planning PART 2! We are holding a 2-hour follow-up session so that as many community members can offer their ideas in terms of strategic planning on Tuesday, September 2nd at 7:30pm at the Town Office. All are welcome! I’m really looking forward to hearing even more fantastic ideas about how Council can help facilitate business development and beautify the Town! The first part of the town-organized strategic planning retreat for business & tourism development went superbly. We got great community input: Twenty-seven residents and stakeholders participated in the eight-hour session that was held on August 23rd! A big THANK YOU to all participants! A great big THANK YOU to everyone who helped out with Witless Bay’s bid for the Tidy Towns competition this year! Going around the town with the judges, it was easy to be proud of what our many volunteers, service groups & committee members had done to shine up the town! Thank you to everyone who pitched in today, yesterday, last week, and over the past months – it was a fantastic community-wide effort! Nothing left to do now but cross our fingers, since the results will be announced next month! The Heritage Committee’s “Name this Thing” contest was a great success at the PuffinFest. The antiques sure kept a lot of people guessing! Congratulations to the two contest winners: Colleen Dalton and Alexa Pynn! SEPTEMBER 7TH: COME OUT TO MEET THE FOLKLORE STUDENTS! A group of Masters and Ph.D. students will be spending three weeks in Witless Bay this September, working to record our town’s traditions and customs. They get here on Sunday, September 7th, so we’re organizing a meet-and-greet at the new rec centre! Come join us for supper and a time, and don’t forget your instruments! Mummers allowed in! During the Fall and Winter, the Community Enhancement Committee will be switching to monthly meetings. Meetings will take place on the first Tuesday of each month, at 7:30pm. New members of all ages are always welcome! animals, and hunger. During the next few weeks (called “Puffin Savings Time”), please dim or turn off unnecessary lights. Puffins are easily trapped in window wells, so if you have them on your house, please check them each morning. The Tidy Towns Judges will be coming to Witless Bay on August 18th. This means that we have two weeks left to shine up the town! We will be having a COMMUNITY POTLUCK LUNCH with the judges at the new Rec Centre starting at 1:00pm – please bring a dish you feel represents Witless Bay’s culture and traditions, or something delicious you love making! All are welcome! The Town of Witless Bay’s application for a Community Capacity Building project was successful! The Province is financing a one-day Economic / Tourism Development Strategic Planning Retreat, which will be held on Saturday, August 23rd. All residents are invited to participate – please register by contacting the Town Office: 334-3407. Congratulations to AnnMarie Hann and Jacqueline Mair, the newest members of the Witless Bay Town Council. We look forward to working together to make our Town an even better place to live and do business! Ten graduate students in Folklore will be spending three weeks in Witless Bay this September, and we need five more beds (two need to be twin), two more dressers, and a refrigerator in order to accommodate them. If you have pieces that you’re willing to lend for the month, please call the Town Office and we will arrange for it to be picked up: 334-3407. Thank you! that the recreation area is a smoke-free zone. During the month of August, there will be roadwork throughout the community, with extensive ditching, road repairs, shouldering, and swales to better manage storm water. We apologize for any inconvenience or delays this may cause. Town Council and staff wish everyone a fantastic month! Public Hearing about the Municipal Plan! This was a great turnout for a by-election (227 in total) – congratulations to all candidates! The swearing-in of our TWO new members of Council will be in the coming weeks. We will keep everyone posted! A Crown Land Reserve in Witless Bay? At the July 2014 public meeting of Council, it was decided that the Town would invite the Province to initiate the process of establishing a Crown Land Reserve along the town’s southern coastline. enjoyment of this easily accessed pristine ocean shoreline & wilderness environment for generations to come. This is just the start of what we believe will be a long and comprehensive process – the establishment of a Crown Land Reserve is ultimately a decision of the Provincial Government. If the Province is receptive to Council’s proposal, we will be holding a public meeting to outline in more detail what is being proposed, why it is being proposed, and to discuss the project with all stakeholders before any decision is finalized. c. Correspondence: Municipal Affairs – Capital Works Applications Submitted. d. Notice: Development Control Officer. f. Motion to construct road leading to Municipal Garage. g. Notice of Motion to begin process of moving Fire Department to Municipal Garage. h. Replacing the fire hydrant near the Fish Plant. i. Enquiry RE: Filling the pumper truck at the river. j. Recommendation to the Regional Fire Committee increase the honorarium awarded to active members of the Witless Bay Regional Fire Department. d. Request to Department of Environment & Conservation for the establishment of a Crown Land Reserve (under Section 8 of the Lands Act) for 99 hectares of crown land on the Town’s southern coastline. e. MMSB Compost Bin Program results. Events include a hike, a healthy heart picnic, community olympics, a cake cutting, refreshments, a community BBQ, face painting, Sky High Amusements, local entertainment, and FIREWORKS! The Mayor’s Hike for Heart & Stroke starts at 6:00PM at St. Bernard’s Elementary, from where we’ll walk to the recreation grounds. Wear a backpack & bring a blanket & a healthy picnic! The celebrations will start at the Recreation Grounds at 6:45pm. A big THANK YOU to all of the volunteers and community groups who pitched in to make this event possible: The O’Connor 50+ Club, the Witless Bay Heritage Committee, the Witless Bay Regional Fire Department, the Witless Bay Kinsmen Club, our local RCMP detachment, Our MHA (Minister Keith Hutchings), Town Council, Town Staff, and the members of our Community Enhancement Committee. Most especially, THANK YOU to the BBBAA’s leadership & its fantastic team of dedicated workers & volunteers for organizing this great event! Planning on building a house or an extension? Hoping to put up a deck, a fence, or a shed? Thinking about subdividing your land? Planning to excavate a piece of land? Thinking of putting in a pool? No development, construction, extension, demolition, excavation, grading, clearing or grubbing is to take place within Town boundaries without a permit from the Town. To protect residents & landowners from issues resulting from unregulated, unauthorized & unlawful development, the Town of Witless Bay requires that a permit be obtained prior to the start of any construction project or project which involves machinery and transforms the landscape. Building on, redirecting or altering a watercourse or ditch without approval is an offense. It makes sense to ensure that what you’re planning to do is allowed before you start building, since no one benefits from having to dismantle what wasn’t done according to the regulations. Developers, builders, & property owners are responsible for constructing according to the plans submitted and for meeting all municipal, provincial & national standards. A permit must be obtained for the construction of any driveway. Driveways must be properly ditched and a culvert meeting Town standards must be installed & inspected before a permit can be granted to develop a new lot or build a new home. Building on, redirecting, or altering a watercourse without approval is an offense. Developing, building, constructing, excavating, grading, clearing or grubbing without a permit or with an expired permit carries a fine of up to $5,000 for a first offence. If construction contravenes zoning regulations, laws or by-laws, an additional fine of up to $10,000 may apply. The owner is responsible for the cost of dismantling the construction and restoring the site if so ruled, as well as the cost of rectifying any problems. The daily fine for disobeying a Stop Work Order is $500. If you’re considering a project, please visit the Town Office to obtain an application form & a copy of the applicable bylaws, policies & procedures. Council meets on the second Tuesday of every month, at 7:30pm. For your application to be considered at the next public meeting of the Town Council, the deadline for submission is Thursday, June 5th at Noon. This is simply an informational pamphlet – not a complete list of the Town’s development regulations. In case of discrepancy between the official text and the text on this page, the official text shall prevail. The Town Council of Witless Bay is hosting a short “Learn to Compost Workshop” to help residents learn how to use composters to their full capacity! DATE CHANGED TO JULY 1st! Starting at 10:30am at the school, we will make our way along the river trail leading to our recreation grounds, where we’ll share a healthy picnic & celebrate the Grand Opening of the new Community Recreation Building. After this, we’ll have Community Olympics, where both kids & adults will compete in potato sack races, tug-of-war, egg & spoon races, 3-legged races, and other sporting events! A good number of community groups and sponsors will be helping out at the event; we’ll keep you posted on this as details are set. Remember to wear a backpack (with a picnic to share inside!) so that pictures of the event look great! The Town of Witless Bay is currently in the first stages of developing an economic and tourism development strategy. On August 23rd, Council will be holding a strategic planning session to help establish a strategic vision and determine priority areas for action planning. Join us to help give direction to our Town! Please contact the Town Office to register. Through an MMSB-funded program, the Town of Witless Bay has purchased 50 composters, which are now available at cost ($25 instead of $80+). Sold on a first-come, first serve basis, they’re going fast – stop by the Town Office and pick one up! At the May 2014 meeting of the Witless Bay Town Council, we officially ratified the Town’s Regulations on Permits. The great majority of these were not new regulations – they were adaptations of the existing regulations. The intent of many of the changes made was to soften the current regulations for residents, making the regulations less onerous for small-scale projects. The intent of other changes proposed is to protect residents and landowners from potential issues resulting from unregulated, unauthorized, and illegal development. For most residents, low taxes are an important consideration. Recognizing this, Council has reduced the mil rate by 11% in 2014, from 5.5 to 5.0.
o Residents may now speak before a vote is made on an issue. o A discussion session follows each public meeting. o Individuals and groups can make presentations during public meetings. • The Agenda for public meetings is now posted online prior to meetings. • Minutes of public meetings are posted online. • There are now two residents’ advisory committees who help provide advice to Council: The Heritage Committee and the Community Enhancement Committee. Healthy development benefits everyone in the community. Council has worked to ensure that long-term growth is sustainable and beneficial to everyone. • We have been working with developers to ensure that new developments benefit all residents and avoid future financial & legal liabilities for the Town. • We have started preparing a Tourism & Economic Development plan for the town. • We are proceeding with a feasibility study for hiring a Compliance Officer. • Evaluated development applications for 14 new homes & 20 secondary structures. • We have issued permits for FIVE NEW BUSINESSES in the town! • Evaluated and made decisions on five subdivision development proposals at various stages. Safety is an important priority for our Town Council. • This Spring, Council will be installing a number of road signs throughout the community to control traffic, including speed limits & clearer indications for dangerous features. was undertaken by our Public Works Committee, and issues were addressed. We have been revamping the town’s policies and procedures to better serve residents and help ensure that their interests are protected. • We have redrafted the Regulations on Permits. • The building application form is now more user-friendly and less confusing. • There is now an official ratification process for community groups & associations. • Council has adopted the iCloud system for safe storage of town records. • The NEAR Plan Oversight Committee and Working Group. • The North East Avalon Joint Councils Committee. • The Southern Shore Joint Councils Committee. • Applied for funds to develop a Tourism and Economic Development Plan. • Applied for funding for Phase II of the Southside Track. • Nominated the Heritage Committee for the NL Environmental Awards. • Assisted our Regional Fire Department with an application for a new rescue vehicle. • Applied for funds to install doors to the front of the municipal garage. • Council is funding 50% of the Regional Recreation Director’s position, with assurances in place for accountability and transparency. Monthly reports are submitted to Council. • The Community Enhancement Committee is working on the town’s new “look,” including the selection of an official town flower, planning for new “Welcome to Witless Bay” signs, a community mapping initiative, and a long list of other exciting projects. We will have details about this work in the next newsletter! WITLESS BAY, NL – The Town of Witless Bay is home to the Witless Bay Ecological Reserve, which contains North America’s largest colony of Atlantic Puffins (with over 260,000 mating pairs) and the second largest colony of Leach’s Storm Petrels in the world (with over 620,000 pairs). Witless Bay also has a Puffin and Petrel Patrol, which works to rescue stranded chicks and return them safely to the ocean (see the mini-documentary on this here: http://youtu.be/mtSHVHE4fj0). As such, the Town of Witless Bay has a special duty to protect the environment. In order to raise awareness about this important responsibility, the Town is teaming up with the area’s Kinsmen Club and the Witless Bay Community Enhancement Committee to make the 2014 Kinsmen Community Cleanup a record-breaking event. The Witless Bay Kinsmen launched the annual Community Cleanup six years ago as a way of getting the community to band together and work towards a common goal. On SATURDAY, MAY 10th (weather permitting), residents will scour the ditches and the beaches, collecting garbage and debris. 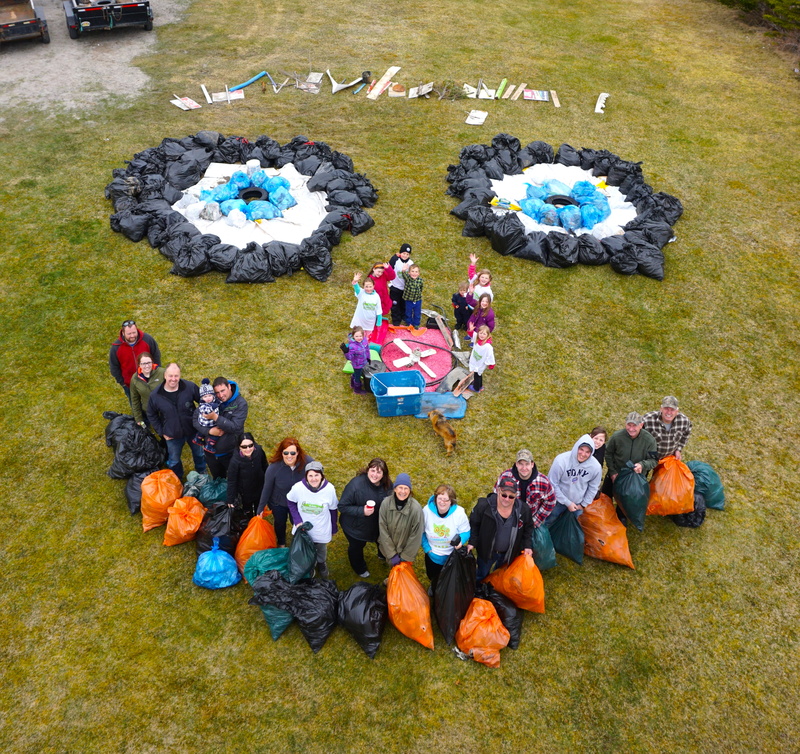 In order to demonstrate the impact of pollution on the nearby bird sanctuary, volunteers will then attempt to establish a Guinness World Record by constructing the biggest puffin ever made out of garbage! The event starts at 8:00am at St. Bernard Elementary School, and is sponsored by the Town of Witless Bay, St. Bernard Elementary School, Witless Bay Home Hardware (who is generously providing gloves and safety equipment), and Tim Hortons (who will be providing prizes, refreshments and snacks). The Town of Witless Bay is a traditional Newfoundland outport community located thirty kilometres from St. John’s on the popular Irish Loop. Home to the Witless Bay Ecological Reserve, the town is the setting for Howard Norman’s novel, The Bird Artist. 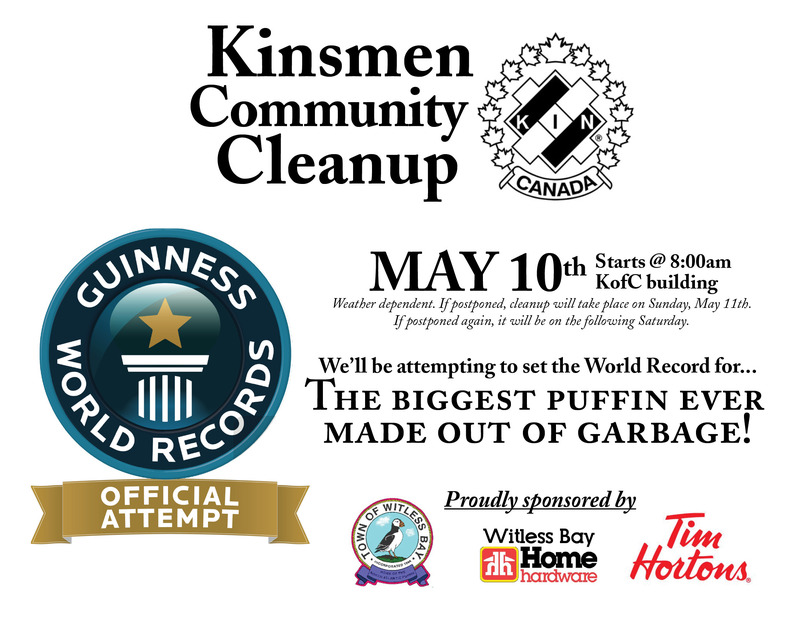 During our annual Spring Cleanup (organized by the Kinsmen, in conjunction with Council and the Community Enhancement Committee), we will be attempting to break a world record for the BIGGEST PUFFIN EVER MADE OUT OF GARBAGE! Join us on May 10th to help make it happen! 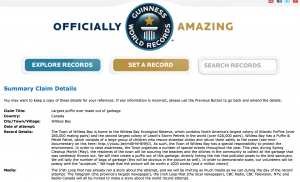 Below is a screenshot of our application to Guinness World Records, along with the poster for the event. Click HERE for a printer-friendly version of the poster – please help by printing & distributing it! The Town of Witless Bay will be attempting to break a world record for the largest puffin ever made out of garbage! The South Side Track road will be closed from 7:00am to 5:30pm as of Thursday, April 24th to allow for a major Government-approved road reconstruction project. Signage will be installed directing traffic to Dunn’s Lane, which will be used as the detour route while the work is ongoing. The Town apologizes for the inconvenience. Witless Bay Town Hall – 7:30 p.m.
a) Compilation of a list of all roads that are currently substandard, and a quote from the Town’s Engineer to bring these up to standard. b) Standing offers from local contractors for all equipment they possess. Let’s not risk our lives traveling in this weather! Our next meeting will be on April 15th. On March 25th, Minister Nick McGrath announced that the Robert E Howlett Memorial Drive would be extended up to Bay Bulls. The planned route begins at the current end of Robert E. Howlett Memorial Drive (at the intersection of Route 10), and will continue south 9.5 kilometres, parallel to the current road towards Bay Bulls. Click HERE to read more about this fantastic news for residents of Witless Bay!!! CONTEXT: In 2010, a developer purchased a 1½-acre parcel of land and applied to purchase a larger parcel of neighbouring Crown Land in order to make the construction of a road leading to this parcel feasible through the selling of other lots. Access to the property was identified as a possible problem from the very first time the proposal was presented to Council, and it came up as an issue throughout the history of the file. A rezoning request was eventually submitted to Municipal Affairs, who agreed to the request based on two conditions, one of which being that Mullowney’s Lane was to be widened to allow for the increased traffic flow from the proposed development. On Tuesday, March 11th, 2014, Witless Bay Town Council passed a motion to preclude the widening of the lane to accommodate the proposed development at Gallows Cove / Ragged Beach. This motion also terminated the rezoning process and closed the file on this development. Council’s decision was not taken lightly, and was based on an assessment of the many interests and the many considerations at play. Past members of Council had been very clear on the fact that Mullowney’s Lane would not be widened to allow for the proposed development. The former Mayor had even gone on public record guaranteeing that the lane would remain untouched. The ethical question of the seizure of land and property (whether through outright expropriation or through other means of seizure) that would have been necessary to make access to the proposed development possible was a major consideration for a number of councillors, both past and present. Another consideration was the overwhelming opposition to the project. A very large proportion of the residents of Witless Bay actively petitioned Council and the Provincial Ministers in charge of various portfolios to help protect the only easily accessible beach with a “private” feel in the Town. One group even resorted to litigation in an attempt to stop the project (at great cost to both this group and the Town). The Public Consultation process that was held to allow for various stakeholders’ opinions to be heard showed resistance to the project, and the report submitted by the Public Consultation Planning Committee was squarely opposed to it. The Planner responsible for drafting the Witless Bay Municipal Plan – an expert in Town planning – also advised against it. Many stakeholders voiced concerns about the potential detriment that the proposed development could have on the integrity of the East Coast Trail, and a number of experts, specialists, researchers, associations, and citizens’ organizations voiced concerns about the environmental impact that the proposed development could have on the nearby Witless Bay Ecological Reserve, as had the Province’s Minister of Environment and Conservation. For this project to see its way to fruition, Council would also have to allow the “bending” of a number of rules, including some of the Town’s own regulations. Council does have the power to do this, but allowing the rules to be bent sets dangerous precedents. Other developers then expect the same freedoms, which can put the Town in a questionable legal position. The developer did offer shouldering some of the costs, but this project would nonetheless require a willingness on the part of Council to invest significant resources (including a possibly very substantial financial commitment). New developments should benefit residents; the costs associated with these should never exceed the tax revenues they’re hoped to generate. In contending with the various unforeseen costs, another question might have been: “Would Council have felt comfortable telling residents that another $10,000 of taxpayers’ money had been spent in order to enable this project? Would Council be comfortable announcing a $100,000 outlay? Or $500,000?” At which point does such a project cease being viable, given residents’ opposition to it and the other considerations at stake? Since Council’s mandate is to help ensure a better quality of life for residents, projects adopted by Council must also consider the impact of these on the lives of residents. In which ways would the proposed project have elevated residents’ quality of life? In which ways would it have been detrimental? Lastly, should Council have chosen to ignore the issues listed above to allow the project to go ahead, what impacts could the proposed development have on the town in the future? When Council looked at the “bigger picture” and gauged the compounded effect of all of the concessions that would have been necessary to allow for the project to go ahead, Council assessed that allowing the rezoning request to proceed would not be in the best interests of the Town. We do empathize with the developer, but our responsibility as a Municipal Council is to weigh the benefits of a project against the costs associated with it, and to make decisions that are in the best interests of the Town in the long term. Now that the file is closed, Council will be working to mend bridges and striving to make Witless Bay the positive and uplifting community that it should be again. IS WITLESS BAY THE NEXT TIDY TOWN? This year, Witless Bay will enter into the Province’s “Tidy Towns” contest! To help prepare the town for the competition, Council has created the Community Enhancement Committee. The main goal of this committee is to energize residents’ community spirit and make Witless Bay a better, even more beautiful place to live. Meetings will be informal, and will be held on the first and third Tuesdays of each month. The first meeting will take place on TUESDAY, FEBRUARY 4th, at 7:30pm in Council Chambers. We hope to see you there! THE REGIONAL WINTER CARNIVAL is soon here! It will take place from February 21st to March 2nd. The brochure with the full list of activities will be sent in February, but you can also check for updates on www.bbbaa.net. The lineup for this year includes Carnival Breakfasts, dances, seniors’ fitness events, skating, sliding, talent shows, the Seniors’ Outreach Dinner, card games, Bingo, the 50+ Potluck, Winter Frolics, a youth ping-pong tournament, a youth pool tournament, and more! To volunteer, please contact Trudy: rrd@nf.aibn.com / 334-2300! • Taxpayers are entitled to a 5% discount on residential taxes if paid by March 30th 2014. • Seniors receive a total of 10% discount on residential taxes throughout the year. • All taxes are due and payable by May 31st 2014. Any taxes not paid by May 31st 2014, or without arrangements being made, will be charged an interest rate of 18% per annum. Interest on overdue accounts is calculated automatically, but will not be posted on accounts until after the final deadline. If the account remains unpaid after the deadline, the amount shown on your invoice will be a calculation of interest from January to the end of May. The office cannot remove interest from outstanding accounts. • The Town accepts Visa, MasterCard, Debit, and pre-authorized payments. If acceptable arrangements are made with the Town Office before May 31st 2014 to have your account paid in full by November 30th 2014, no interest will be charged to your account. • Delinquent accounts unpaid by November 30th 2014 will receive a final notice that their account is being prepared for submission to Credit Recovery for collection. THE ANNUAL BBBAA AUCTION DINNER & DANCE is on May 10th this year. For more info, please contact Trudy at rrd@nf.aibn.com or 334-2300! WITLESS BAY HAS A NEW COUNCILLOR! Due to departure of Jeff Swain, who recently resigned from Council (Jeff is moving out of the community), there was a vacant seat on Council. On January 28th 2014, this seat was filled by Terry Dunne, who was acclaimed. Terry will be sworn in at the February 11th public meeting of Council. 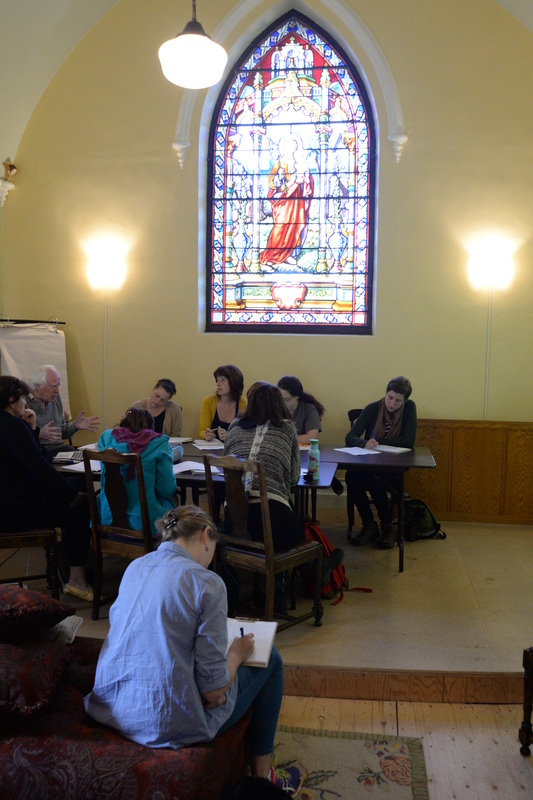 The incoming class of Masters and Ph.D. students at MUN’s Department of Folklore will be taking part in a three-week field methods course in Witless Bay this coming September. 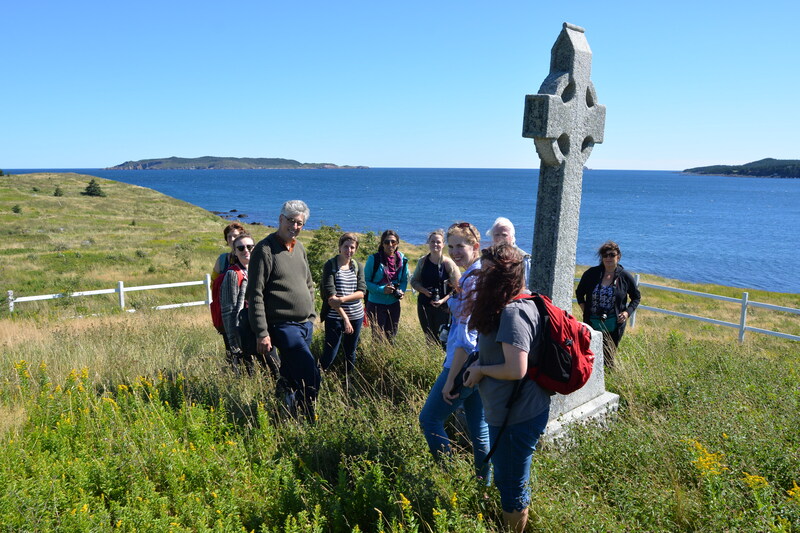 From September 7th to 27th, these graduate students will learn how to document heritage buildings in the community, learn how to conduct interviews with residents, and learn about Witless Bay traditions, practices, local knowledge and skills. Students will be living in the Holy Trinity Convent during their stay in Witless Bay. Several guest lecturers and experts will help out in the teaching and documentation. At the commencement of the field school, a welcome gathering will be held. 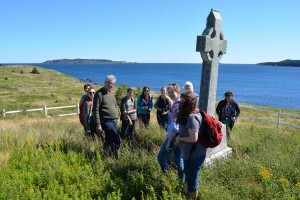 Throughout their stay, students hope to immerse themselves in the daily life of Witless Bay, learning about the landscape, built heritage and oral traditions—meeting, visiting and learning from local residents. Students will keep a blog and reflect on their daily activities. During the final day of the field school, a presentation will be made to the community of what students found and experienced. The documented traditions will be available online through Memorial University’s Digital Archive Initiative. A published booklet of Witless Bay buildings and landscapes documented in the field school is also planned. For more information, please contact Dr. Gerald L. Pocius (gpocius@mun.ca; 864-8366). • Checking in on neighbours (especially seniors) to offer help. • Pairing up with a neighbour who is equipped with an off-grid heat source (a wood stove, an oil furnace, etc.) before the next power failure. Ensure that neighbours know they are welcome to “visit” when the power is out! • Respecting posted speed limits when driving. • Avoiding dumping any snow onto the roadway. • Wearing bright and/or reflective clothing when out for a walk or jog. In order to ensure fairness and transparency across the board, Council has ratified the following regulations to help guide us in our decision-making. The ratification process is simple and straight-forward – associations simply have to fill out a one-page “Association Ratification Form” in order to have their requests (also a one-page form) considered. A. An “Association” shall be considered as a group of persons who have come together to share a common passion and achieve a common goal. Associations must have a clearly defined purpose that does not conflict with the Mission, Vision, Values, Goals, or Objectives of Council. The association must intend to carry out activities that do not infringe any federal, provincial, municipal or other regulations and which will not interfere with the business of the Town. The association must not infringe on the rights and privileges of others, including the rights of privacy and of freedom of expression. An association is a separate legal entity from the Council, subject to its own rights and obligations. The commitments of an association are the responsibility of its members, and under no circumstance shall Council be held liable for their actions. B. In order to receive support or funds from Witless Bay’s Council, an association must have been ratified by Council. Associations seeking ratification by Council must submit a duly completed “Association Ratification Form.” For an association to be ratified, at least 20% of its membership must reside in Witless Bay. If this condition is not met, the association must demonstrate that a minimum of 20% of the association’s activities directly benefit the Town of Witless Bay and its residents. C. The financial contributions that the Council may grant to an association should not constitute the association’s only source of income. Associations must finance themselves through their members’ contributions and other regular channels. Only when such sources of income prove insufficient will the Council consider granting financial support. E. Associations seeking funding from Council must submit a duly completed Funding Request Form. F. In order to receive funds, the association must hold a bank account in the legal name of the association, and must not have any outstanding debts with Council. G. Funds must be used towards serving the residents of Witless Bay. H. Funds must not be used for the private use of a few individuals. I. Council will not disburse funds for direct donation to charity, the cost of alcohol served at any event, or the day-to-day administrative costs of an organization. J. Any association receiving funds from Council must list the Town of Witless Bay as a sponsor in all advertising for the event or project for which the association received funding. – Does the intent of the support requested fit within Council’s mandate? – How do the support requested contribute to the success of the association’s event or project? – How do residents of Witless Bay benefit from the event or project? – How much external fundraising has the association done? At the November 26 meeting of Council, Notice of Motion was given for the ratification of the following Regulations on Permits. The great majority of these are not new regulations – they’re adaptations of the existing regulations. The intent of many of the changes proposed below is to soften the current regulations for residents, making them less onerous for small-scale projects. The intent of other changes proposed is to protect residents and landowners from potential issues resulting from unregulated, unauthorized, and illegal development. Councillors have been asked to review the proposed regulations so that we can ratify them at the May 2014 meeting of Council. Residents are invited to give their feedback on these as well! 2.No development, construction, extension, demolition, excavation, grading, clearing or grubbing is to take place without a permit from the Town. 3. All building applications must be must be duly filled out and signed before being considered by Council. Applications must be in the Applicant’s name, and must be accompanied by a duly filled out plot plan, the applicable application fee, and a legal survey (for new home constructions and commercial applications, the survey must be not older than 5 years). 4. The fees related to permits will be according to the Annual Tax Structure adopted by Council. 5. If the applicant has any outstanding debts with Council (e.g. fines, levies, late taxes, taxes owing from previous years, etc. ), this debt must be paid in full before any application is considered for approval. (As per the Municipalities Act, Section 404). (Example: The City of St. John’s Building Bylaws read, “Notwithstanding any other provision of this By-Law any person who owes outstanding fines to the City of St. John’s for a by-law or regulatory violation for which he has been convicted shall not be entitled to a permit issued pursuant to this By-Law until such time as all such outstanding fines have been paid” (9.1). 6. Permits issued by Council are valid for one year from the date of issue, with the option of renewal for one year. After the second year, the applicant must re-apply to the Town. 7. Permits that are issued to an applicant cannot be transferred. If a property changes hands at any point before the construction is completed, the purchaser must make a new application to the town once he is in possession of a legal deed of conveyance, and submit all required documents with the application. 8. The Town does not provide compliance or occupancy permits. Compliance with existing codes is not implied or warrantied by Council’s issuance of a permit. Council’s approval of developments is in principle only, and subject to final approvals by the appropriate government agencies. The developer of any residential, commercial, or industrial development in the Town of Witless Bay is responsible for meeting all current provincial and national standards. 9. The applicant and builder are both responsible to construct as per submitted plans. Any changes must be approved by Council, in writing. 10. Permits to develop will not be issued on newly-developed roads until the road is legally turned over to the Town. 11. A driveway must be properly ditched and a culvert meeting the Town’s standards must be installed and inspected by Council before the Town can grant a permit to develop a new lot or construct a new home. 12. There shall be no unauthorized ditch filling or altering. Building on any watercourse constructed as a public storm sewer or ditch without prior approval from Town Council is an offence. Written notice will be given to the property owner that the installation will need to be removed upon the Town identifying, at its discretion; i) a potential detrimental effect to Town-owned infrastructure, ii) unsafe or failed conditions, or iii) the installation as a contributing cause to drainage issues. The property owner will be given five weeks (35 days) to remedy the issue. If the issue is not resolved within 35 days, the Town will rectify the issue at the owner’s expense. 13. To construct, renovate, demolish or excavate without a permit or with an expired permit carries a fine of not more than $10,000 for a first offence and not more than $25,000 for a subsequent offence. In addition, if construction contravenes the Town’s zoning regulations or by-laws, an additional fine of up to $10,000 may be levied. Also, the owner will be responsible for the cost of dismantling such construction and restoring the site if so ruled, and the cost of rectifying any problems identified by Council. In most Canadian cities, the fine for building without a permit is normally up to $50,000 for a first offence and up to $100,000 for subsequent offences. Most towns with this type of bylaw specify $25,000 for a first offence and up to $50,000 for any subsequent offence. 14. Stop Work Orders can be issued by Council at any time if no permit has been issued for the civic address/addresses in question. Where a permit has been granted and has not yet expired, any Stop Work Order must be sanctioned by Council during a public meeting.The daily fine for disobeying a Stop Work Order shall be $500. 15. Development applications which do not conform to the Town Plan, municipal by-laws, the Municipalities Act, and/or other development regulations will be denied. Specific reference to the regulations in question will be cited in the Town’s written response and denial. 16. Whenever possible, Discretionary Use Notices, Variance Notices, and Stop Work Orders that are posted will be listed by civic number only, and will be accompanied by a map as well as the intended use of the land. Town Hall – 7:30 p.m.
Our Council in Witless Bay now has a new member! Terry Dunne was acclaimed in the By-Election that was held on January 28th! At our January 2014 Council meeting, we created the Community Enhancement Committee! Our first meeting will be on Tuesday, February 4th, at 7:30pm in the Council chambers. Join up to help make Witless Bay an even better place to live! k) Responsible authority for repairing/replacing culverts within the town – Confirmed by the Town’s Engineer the authority lies with the town, unless the culverts are on brooks, streams, etc., whereby they then become the authority of the Department of Environment and Labour. b) Motion to suspend rules in order to extend the deadline for submissions for the January 7, 2014 public meeting’s agenda by 24 hours. c) Kendall Engineering: Track Road & Harbour Rd. a) Replace siding on residence on 23 Northside Track – Motion only. The Town Council of Witless Bay believes in open, accountable, and accessible government. Council and council committee meetings are conducted in public, and everyone is invited to attend. A discussion session follows each meeting, where the general public may address Council freely. Individuals and organizations are also able to make presentations and appear as a delegation at Council meetings. We publish agendas at least 48 hours in advance of the meetings. Agendas & minutes can be found on the Council’s website. Any delegation wishing to address council is required to notify the Town Clerk in writing prior to 12:00pm Noon on the Thursday prior to the Council meeting for inclusion on the agenda. There will be no discussion of items not on the agenda during public meetings of Council. The delegation must appoint a spokesperson, who will appear before Council shortly following the adoption of the minutes. While Councillors may ask questions to a delegation’s spokesperson, there shall be no debate at this time. The members of the delegation have a right to sit through the remainder of the council meeting, but have no right to address council after having presented their case. During meetings of Council, the Chair may entertain a request to speak from a member of the general public if this person has information to offer that is directly pertinent to the motion on the floor. The member of the public must follow the proper procedure by waiting for all elected Councillors to have had the opportunity to discuss the matter, and signal their wish to participate in the discussion by raising her/his hand and waiting to be acknowledged by the Chair. Please note that defamatory, frivolous or offensive remarks, regardless of their target, will result in the individual’s immediate expulsion from Council chambers. 1. Regular public meetings of Council shall be held in the Town Office, preferably every two weeks. 2. The Mayor, the Deputy Mayor in the Mayor’s absence, or any two members of Council may call a meeting. All regular meetings of Council must be preceded by a notice of at least 48 hours, which must be coordinated by the Town Clerk. 3. In an emergency situation, a special meeting of Council may be called by a majority of councillors in office. Such emergency meetings must be preceded by a notice of at least 2 hours, and shall deal with only the item(s) of business for which the emergency meeting has been called. 4. Notice for meetings must include the final version of the agenda, in such a manner as to apprise the public of the business to be discussed. Broad items such as “Report of the Chair” shall be avoided. 5. All correspondence, accounts, applications, or any other item to be discussed at a public meeting of Council must be submitted to the Town Office by 12:00 p.m. noon on the Thursday prior to the Council meeting for inclusion on the agenda. Any item submitted after this deadline will be addressed at the next public meeting of Council. 6. During public meetings of Council, there shall be no discussion of items not on the agenda, nor shall there be action on items not on the agenda. 7. Notice of motion must be given prior to consideration of all regulations or amendments thereto and for the re-consideration of a previously adopted motion or resolution. 8. Council will not act on anonymous complaints. a. The date, time, and place of the meeting. b. The exact wording of all motions for which a notice of motion has been given. a. The date and place of the meeting. b. The time at which the meeting was called to order. c. A record of the attendance at the meeting, including the time when individual councillors arrived or left. d. The exact wording of all motions and resolutions put before council. e. The names of the mover and seconder of each motion or resolution. f. The names of councillors in favour, against, or abstaining on every motion or resolution. g. A brief description of all reports or other documents presented to council, including presentations made by any delegations. h. Any declaration of a conflict of interest by a member of council and a record of that councillor’s leaving the meeting while the matter is under discussion. i. The time of adjournment. 12. Quorum for public meetings of Council is four councillors. 13. All in attendance shall respect and follow the Rules of Order established by Council. 14. Unless a conflict of interest is declared or a councillor has been permitted to abstain by a majority vote of the other councillors in attendance at the meeting, all councillors must vote on all matters before Council. This includes the Mayor, who has one vote. An abstention is the equivalent of a negative vote. 15. All business of Council shall be conducted by roll call vote (Municipalities Act, 212(4)). 16. A motion or resolution is considered to be defeated in the case of a tie vote. 17. Motions requiring a two-thirds majority require the assent of two-thirds of the councillors in office, not two-thirds of the councillors present (i.e. five supporters are needed when seven councillors are in office). 18. If a motion is not supported by a majority vote, it must be deferred until the next public meeting of Council. If not finalized on that date, three months must elapse before Council includes it on the agenda again. 19. All committees of Council act in an advisory capacity, and do not have any power to act on their own. All committee recommendations must be discussed and decided by Council before becoming valid. 20. Council may go into closed session when a two-thirds majority of Councillors vote that a discussion be held “In Camera.” Decisions taken during closed sessions are not valid until they are moved, seconded, and passed at a public meeting. 21. Any delegation wishing to address council is required to notify the Town Clerk in writing prior to the deadline for inclusion on the agenda. The delegation must appoint a spokesperson, who will appear before Council shortly following the adoption of the minutes. Delegations’ requests will be discussed by Council at a later point in the proceedings or at a future meeting. While members may ask questions to a delegation’s spokesperson, there shall be no debate at this time. The members of the delegation have a right to sit through the remainder of the council meeting, but have no right to address council after their spokesperson has presented their case. 22. Public meetings of Council shall adjourn at 10:30pm, whether or not all agenda items have been settled. 23. Immediately following the adjournment of each public meeting, there shall be a “Public Comment” section, where the public may talk about anything, and where Council may question the public, but where no further action or discussion is allowed. This “Public Comment” section shall end by 11:00pm at the latest. 24. The Town Clerk shall ensure that the agenda for the public meetings of Council are posted on the Town Website at least 48 hours prior to every meeting, and a notice placed on the door of the town hall. 25. The Town Clerk shall ensure that the ratified minutes of all public meetings are posted on the Town Website within one week following their ratification. 26. Updates to policies and procedures shall be posted on the Town Website as they are adopted, and placed on the Town Hall’s bulletin board. 27. A newsletter shall be sent out to residents at least once every four months. I just got home from our first meeting of Town Council, and am happy to report that it went superbly well. I’m privileged to be working with a group of superbly engaged and involved councillors! At this meeting, we resolved that we will now hold bimonthly meetings of Council instead of monthly meetings. This will not only help expedite the business of Council, but will also allow Council to do more, in real terms, with and for the residents of Witless Bay. At this meeting, I also gave a notice of motion on a proposal for the Rules of Order that Council will be following during its public meetings from now on, along with a notice of motion for an entirely new set of Rules of Procedure (see them pasted below). Both of these will be discussed at the upcoming meeting of Council. In the course this first meeting, it quickly became clear that one key change that we must bring right away is the re-writing of all of our application forms, which are currently unclear, misleading, and confusing. While our Town Plan clearly sets out the rules, regulations, and expectations relating to almost any type of development or permit, the application process doesn’t currently mirror these at all. I’m already looking forward to our next meeting! 1. Regular public meetings of Council shall be held in the Town Office on the second and fourth Tuesdays of each month. 5. All correspondence, accounts, applications, or any other item to be discussed at a public meeting of Council must be submitted to the Town Office by 12:00pm Noon on the Thursday prior to the Council meeting for inclusion on the agenda. Any item submitted after this deadline will be addressed at the next public meeting of Council. 24. The Town Clerk shall ensure that the agenda for the public meetings of Council are posted on the Town Website at least 48 hours prior to every meeting. 26. Updates to policies and procedures shall be posted on the Town Website as they are adopted. Following the swearing-in ceremony and my election as Mayor on October 9th, we resolved that agenda items would no longer be discussed during closed sessions, but out in the open, during the public meetings. This is a small but significant first step toward transparency and collaboration, and I look forward to many more during the first meeting of Council, on Tuesday, October 15th.